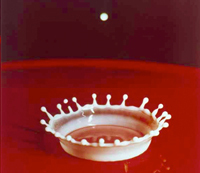 This project celebrates the spirit of a great pioneer, Harold “Doc” Edgerton, high-speed photographer, inventor and professor emeritus at MIT. Viewers, researchers, and historians of science can now access to over 22,000 images of Edgerton materials, 150 films, 8,000 pages from Doc Edgerton’s hand-written laboratory notebooks. Transcribe a hand-written notebook page to make it available by search engines. User interface analysis and programming, specifically in regards to community annotation of images and Edgerton's hand-written notebook pages. In collaboration with the MIT Museum, the Edgerton Center, the MIT Libraries, the Office of Educational Innovation and Technology (OEIT), Academic Media Production Services (AMPS), and researchers Joyce Bedi and Claire Calcagno. The site design was provided by Stoltze Design.